Carol Birch – Talking about Copyright issues. “More opportunities equal more responsibilities” is a simple explanation of copyright. As a librarian, I can read or tell stories to children in the library or as part of a school visit. Fair use also permits me to tell stories in classrooms where I teach graduate students. Responsibilities change when I’m hired as a storyteller, then acting ethically means seeking permission. However, Catch 22’s abound. Clearing performance rights is the first thing to do, when seriously considering a story penned by another. Unfortunately, the first thing publishers and agents ask for are the date(s) and time(s) a story is to be performed. And who knows? For more information on this topic, listen to the podcast and read an article that will be published in UP FOR DISCUSSION in School Library Journal, August, 2007. We’ve got to work together to establish some precedents to which we can all refer when we contact publishers. 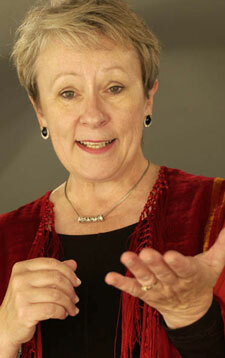 Carol Birch Storyteller – website. Eric Wolf – the documentary mentioned in the Podcast is created by Seinfeld and called the Comedian. This entry was posted on Monday, July 23rd, 2007 and is filed under Episode List, Professional Development, Storytelling Digital, Storytelling in Libraries. You can follow any responses to this entry through RSS 2.0. You can leave a response, or trackback from your own site. In the podcast you related a story about a story by Judith Gorog, Those Three Wishes, which you adapted with Judith’s permission and then Judith then worked off of your version. Where does that leave other storytellers that wants to tell that story? Who do we request permission from? Both versions are published. Yours in Ready to Tell Tales (which seems to give permission) and Judith’s original version in A Taste For Quiet. Just to clarify a point that was not made in your interview: when you seek to use copyrighted material, you are asking for a license to use it, not to extend the copyright or to copyright it yourself. I wonder, if “performance rights” are an issue for some literary houses, that asking for a license to create a “derivative work” (akin to writing a theatrical version) might make more sense. And copyright only applies to the tangible form of a work: a script, a text, a video, a recording. A storyteller cannot copyright a story until it appears in published form (a website counts) such as a recording. And, at the time of this post, any works published in the United States before 1923 are past their “copyright expiration date,” and are in the public domain, so you are free to tell them, modify them, remix and/or record them.